The following post was originally published as an article in the August 2016 edition of Zerb, the journal of the GTC. 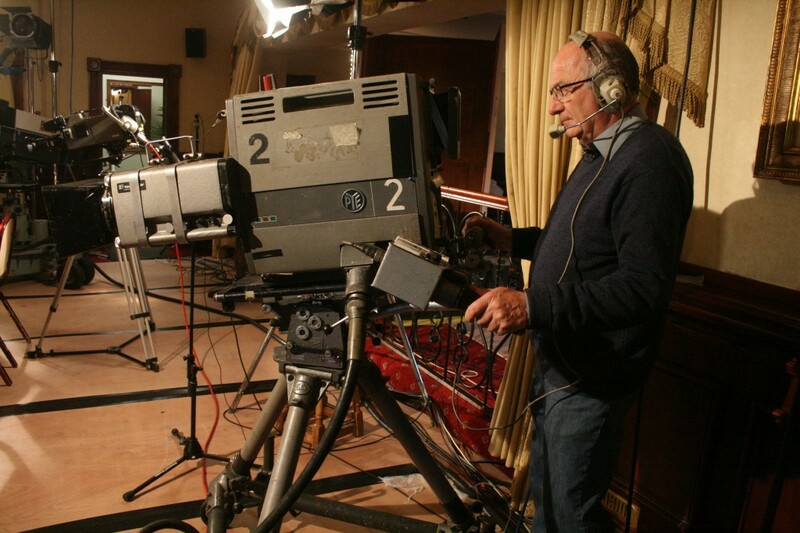 In May, following a similar exercise on film, an ambitious project to recreate an early 1970s outside broadcast, using authentic gear from the period operated by ‘veteran’ crew members who had worked with it the first time round (including GTC members Rex Palmer and Robin Sutherland on camera) successfully came to fruition. The digital producer for the project is former ‘Big Brother’ producer Amanda Murphy, who explains how it all happened. ADAPT is a research project funded by the European Research Council (ERC) and based at Royal Holloway University of London. 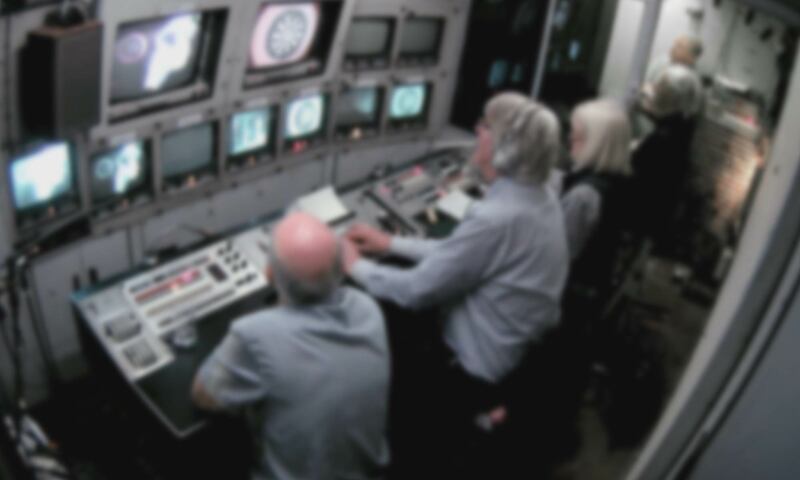 The project’s aim is to film veteran television crews from the 1960s onwards as they are reunited with old, often obsolete kit they once worked with. Through these reunions, the project attempts to demonstrate how and why TV was made the way it was in the past. We opted to start with the 1960s and 1970s as we realised it would be almost impossible to find folks from much earlier to take part. So, after a successful shoot last year, on which we reunited a 16mm film crew with Arriflex and Éclair NPR cameras, we moved keenly on to the challenge of recreating an early 1970s OB. We wanted to capture something of an era when huge swathes of live TV were broadcast via OB: from hours of Grandstand on a Saturday afternoon, through live football and rugby, Wimbledon, the Open golf, to live entertainment shows such as The Good Old Days and It’s a Knockout. This was an amazingly pioneering time, when the challenges involved the arrival of colour TV, and extraordinarily cumbersome and often rather temperamental equipment. 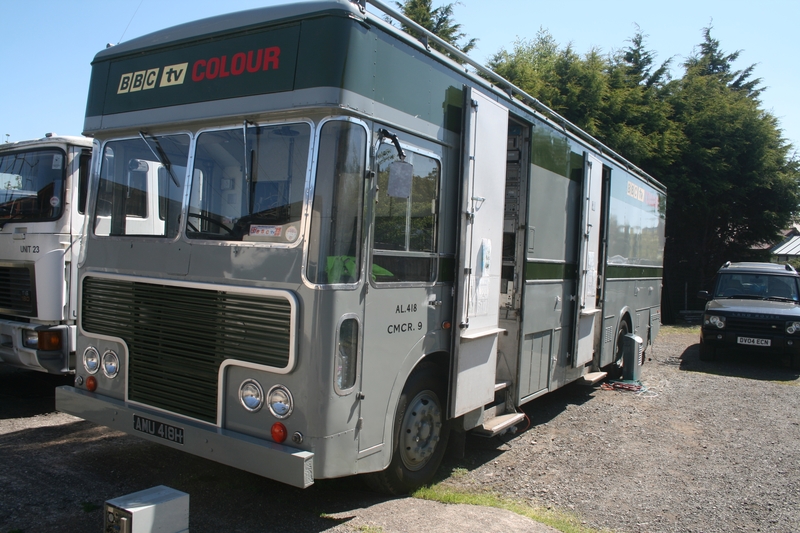 In our search for working vintage OB trucks, I heard about North 3 – a Type 2 Colour mobile control room (MCR), which Steve Harris had rescued from a sad and rusty retirement in an aircraft hangar. So, project leader Professor John Ellis and I travelled up to meet Steve in Hawarden, near Chester, where he and the truck are based. I’m not sure whether it was Steve’s passion for North 3, which he had clearly so lovingly restored, or the fact that we had hacked all the way up to his outpost in Hawarden, but we committed there and then to coaxing this rather complex beast of engineering back into use for our project! Since sport was the bread-and-butter of these Type 2 OBs, our goal was to mount and record a small darts tournament. As we couldn’t broadcast this live (as was mostly done in the day) we would record the event using the old cameras onto a 1” VTR. The idea was to emulate as closely as possible the practical production of a sport OB of the 1970s. But little did I realise then just how ambitious this would turn out to be. First I had to find and recruit a full OB crew (a 16 to 20-strong team, most of whom would be in their 70s, scattered all over the country and busy in their retirements). Then there was the sheer difficulty of getting the various complex areas of the truck to work… racks of monitors; vision engineer controls so that colour matching of the cameras and riding the aperture could take place; the sound desk not long cleared of bird’s nests, on which the tracks would need to be mixed; the director’s vision-mixing desk so that he/she could cut from one camera to another; talkback; comms. Then there was the small issue of the OB cameras! Those who worked with, or know of, 1970s OB units will remember two particular cameras from that era – the Londonfavoured EMI 2001 and the often Northern-based Pye PC80. North 3 (which was Manchester-based in its final years with the BBC) was designed for the PC80. These cameras were huge, cumbersome old colour-tube cameras that weighed around 50kg and generally had to be carried by four men (as it invariably was then) on a stretcher. These cameras were temperamental, even in their prime, needing hours of line-up to get the ‘right’ colour read from the tubes and, even then, they would ‘drift’, necessitating frequent line-up checks and tweaks. So, powering these back up 30 to 40 years later was going to be a rather unpredictable exercise. Would they work again? We really didn’t know. Meanwhile, I was in discussions with Martin Riley of production company Lion Eyes, BAFTA nominee for shows like Peter Kay’s Car Share, over how many cameras we would need to film the proceedings. It had become clear we couldn’t fit camera operators inside North 3 at the same time as a full veteran OB crew, given the compact operational areas. The truck presented all sorts of challenges: space constraints, given that an OB crew and racks of kit would fill almost every inch of it; mounting limitations, as it was an old truck and we had to be careful not to damage it; the need for cameras that could record continuously throughout the day so that we didn’t interrupt our veterans at work; decent lens options; and distance from the hotel where we would set up our ‘video village’ so that we could cable the cameras to recorders. All this had to be achieved on a tight budget as this was an academic research project. We settled on Marshall minicams. Given the area we had to cover and the size of the OB crew, we went for 12 (seven in the truck, one for the commentary area, four in the event room) and three recorders, which would allowing us to record all 12 streams plus our feed in three quad split-screens giving a multi-camera perspective of the entire event. Being able to see simultaneously what various technicians were doing and how people and machines worked together was key to the project. •12 Marshall CV502 MB Pro minicams: 1/3” CMOS sensor and output 1920 x 1080 HD video via HDSDI; powered by 12V DC and draw a miniscule 150ma. Tiny form factor: 2.4 x 2.2 x 1.8”; weight 160g. • Fed to 3 custom decks, each recording 5 streams HD at Pro Res 422 (HQ) onto a single high-speed SSD; this allowed recording of 12 individual cameras and 3 quad splits to give an overview of the action. • Sound was recorded with 16 radio mics plus a selection of ambient mics, resulting in 24 audio tracks including the programme feed from the OB truck. • The output of the OB truck was recorded on a DSR50 DVCAM, enabling the composite signal from the truck as well as the analogue audio feed to be recorded dgitally. • All recorders (both audio and video) were timecode locked. • Monitoring was on three 24” broadcast-quality monitors, each displaying a different quad split at 1920 x 1080 25p. Months turned into weeks and then – with just 10 days to go before the first day of filming – the problems really started to pile up. The 1” VTR we had hoped to record on was still stuck in a dusty cupboard and we had to find 1” engineers (Ian Rutter and Brian Collinson) to help get this back up and running after many years of inactivity (plus an enormous tail-lift van to move and house it). But we did receive some good news from Steve about the EMI 2001: “I have a couple of OCPs I found in the shed at home (mice have eaten the plastic indicator lenses but otherwise OK) and connected one up. Amazingly it works! So we can rack it.” With just a week to go, a few issues remained: we had no cue lights for some of the cameras and no talkback to speak of. More worryingly, the electrician warned us that the 32-amp outlet the hotel had put in especially for our shoot might well knock the entire hotel’s electrical system offline, and so we needed an electrician and maintenance man to install another outlet for our use. In comparison with Steve Harris and Steve Jones’ daily ‘two steps forward, three steps back’ experience, my mammoth mission of finding and recruiting an OB crew seemed less tough. Once I began to contact the potential crew members, via countless emails and telephone calls, this became a pleasure. Meanwhile, local producer Kate Brown joined our team and almost had to move into the location at Northop Hall to resolve an array of daily logistical issues. We had decided on a darts match as a manageable subject for the OB and Kate found and secured darts commentator John Gwynne and professional darts players Glyn and Mark Griffiths. Most magical was watching some of television’s great pioneers in action. This group of men (and one woman), now in their 60s, 70s and even 80s, all fell back into their roles using the lingo and nicknames from all those years before, working together as a team dedicated to achieving our mad mission. There was no ‘It can’t be done’ about it – that simply isn’t in this generation of TV makers’ vocabulary; by hook or by crook they would achieve it. Watching this unfold was one of the most inspiring moments of my filming career. Now we face the task of watching and editing the 11TB – that’s 2350 DVDs worth – of data we have generated. Over the months to come, we will edit the footage, making as much of it as possible available on YouTube, in the hope that future generations will better understand how television was made in the past.